You are athlete, runner, sports fan? You like workout, gym and go fitness?... You want to train but the summer heat does not allow it? If you are suffering with side effects of heat stress, Exprenee has the solution for those annoyances, heat will no longer be a problem for you... The super absorbent fiber weave technology of the mesh towel regulates the water inside and ensures water retention, so it's treating it kind of like an air conditioner, and within seconds you get cold. Like sweat on you skin, when water evaporates it cools. If you are sweating a lot, rinse the salty water out from time to time. ✔ High Technology material "Cooling Circulation System"
★ APPEAL: You have probably bought other cooling towels at 3 times our price that doesn't meet the quality and functionality of Exprenee towels. All chilling towels work on evaporative cooling of water but our mesh material is not PVA that dries out stiff but is soft and pliable and fits nicely into your gym bag. You can use these towels when sailing in warm water or high humidity to stay chilled using them as a bandana, scarf or neck wrap. ★ USEFULNESS: When working in the sun on a 90-degree day you don't want a heat stroke, you can't just power your way through. You need to take precautions. The cooling towel set is the awesome difference maker. You will love our 4 vibrant colors they come in. It will help with your hot flashes too reducing the intensity of them. Great cooling neck wraps for sports. Perfect cool towel head wrap. ★ DESIGN: With our design of weave mesh in our material you can stay cool up to and even longer than 3 hours at a time. Just fantastic for athletes, runners, sports fans into working out at the gym and fitness. Any old microfiber or cotton towel would work but not like our hyper-evaporative system of absorbing of sweat of men or women and keeping you chilling cold. 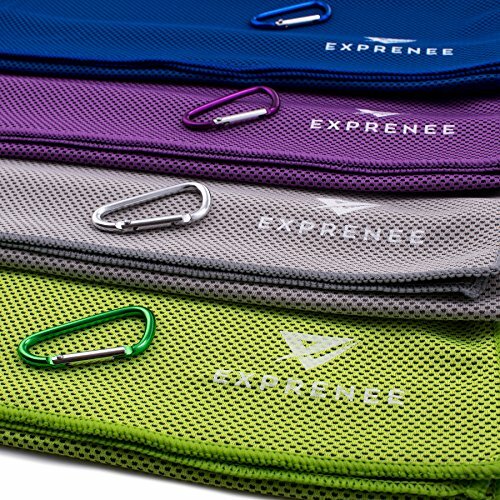 This summer carry everywhere the cool towel wrap with carabiner clip and attractive packaging ready for gift giving. ★ 100% MONEY BACK GUARANTEE: If after you use our cooling towels you are not delighted with the chilling advantage along with absolutely loving them we will refund your money. Our world-class Exprenee customer service wants you to be SATISFIED with your purchase. Absolutely no risk. The 4 cooling towels set comes with our 100% satisfaction guarantee. Get yours and more for gift giving TODAY! If you have any questions about this product by Exprenee, contact us by completing and submitting the form below. If you are looking for a specif part number, please include it with your message.